Cerebral malaria (CM) develops in a small proportion of persons infected with Plasmodium falciparum and accounts for a substantial proportion of the mortality due to this parasite. The actual pathogenic mechanisms are still poorly understood, and in humans investigations of experimental CM are unethical. Using an established Plasmodium berghei-mouse CM model, we have investigated the role of host immune cells at the pathological site, the brain. We report in this study the detailed quantification and characterization of cells, which migrated and sequestered to the brain of mice with CM. We demonstrated that CD8+ αβ T cells, which sequester in the brain at the time when neurological symptoms appear, were responsible for CM mortality. These observations suggest a mechanism which unifies disparate observations in humans. The occurrence of cerebral malaria (CM)4 in Plasmodium falciparum infection of humans is strongly associated with the sequestration of infected RBCs in the brain capillaries (1, 2). Sequestration, although necessary, does not alone explain the progression to pathology (3). Obstruction of blood flow and a systemic or local increase of proinflammatory cytokines have been proposed as potential pathological mechanisms; however, confirmatory studies at the site of pathology in humans are limited to postmortem observations. Furthermore, interpretation of human data is complicated by the appreciation that distinct pathological processes can lead to CM (3), and that clinical features are variable. For example, CM in the African child and the Thai adult are distinguishable clinically (4). In a recent series of histopathological observations of fatal CM in children from Malawi, high numbers of leukocytes were noted even in brains where the number of parasitized cells were low (T. Taylor, personal communication). Studies aimed at assessing the role of leukocytes in the pathogenesis of CM would require sequential sampling of brain tissues, which is clearly unethical in humans. Although no animal model reproduces all the features of human CM, mouse models have been highly informative in studies of CM pathogenesis (5). A systemic role for leukocytes has been deduced in a number of experimental CM studies and some subsets were identified as important (6, 7, 8). Studies in Plasmodium berghei ANKA (PbA)-infected mice with CM have shown that leukocytes accumulate in the brain and adhere to the brain endothelium (9, 10, 11). By analogy to the acknowledged role of brain-sequestered parasites, we reasoned that potential host effector immune cells would most likely be observed in the CM brain. To date, no quantitative investigations had been conducted on the immune cells adhering to the brain vasculature. Therefore, we initiated a detailed analysis of the brain throughout the infection. The aim was to investigate whether leukocytes accumulate specifically in the brain, and if so to establish whether any particular subset(s) of these leukocytes could be incriminated in the evolution of the CM pathology. We demonstrate that brain-sequestered αβ CD8+ T cells played an effector role in the neurological symptoms and death due to CM. C57BL/6J and BALB/c mice (7–10 wk old) were purchased from Harlan (Gannat, France) while 129/Ola × C57BL/6J (129,B6) wild-type (WT) mice and 129,B6 CD4-deficient mice (12) were obtained from The Jackson Laboratory (Bar Harbor, ME). C57BL/6J back-crossed TAP-1-deficient (13) and CD8-deficient (14) mice were bred in our specific pathogen-free animal facility. All experiments and procedures conformed to the French Ministry of Agriculture regulations for animal experimentation (1987). Three different lines of Plasmodium were used: the BdS clone of PbA (10) which was kindly given by Dr. B. de Souza (Windeyer Institute for Medical Science, London, U.K.), P. yoelii yoelii 265BY, and P. chabaudi chabaudi clone AJ. Infected RBCs stabilates used to initiate infections were free from other infectious agents and were prepared through in vivo passage in C57BL/6J mice and stored in liquid nitrogen (107 parasitized erythrocytes/ml in Alsever’s solution). Mice were considered to have CM if they displayed the following neurological symptoms: paralysis, deviation of the head, ataxia, convulsions, and coma. One of the two brain hemispheres from mice displaying neurological symptoms was removed and fixed in Carnoy solution for 24 h, stored in butanol, and included in paraffin. For two animals per group, 5-μm sections from the midbrain region were stained with hemalun and eosin. Similar histological samples were obtained from infected but CM-negative mice at the same time of the infection. Sacrificed mice were perfused intracardially with PBS to remove both circulating and nonadherent RBCs and leukocytes from the brain. The brain was then removed and adherent leukocytes isolated using a previously described protocol (15) with minor modifications. Brains were removed and crushed in RPMI medium (Life Technologies, Paisley, U.K.). The tissue-extract was then centrifuged at 400 × g for 5 min. The pellet was resuspended with 10 ml of an HEPES buffer containing 100 mM NaCl, 2 mM KCl, 0.3 mM Na2HPO4 12H2O, 0.01 M HEPES (Sigma-Aldrich, St. Quentin l’Arbresles, France), supplemented with 100 IU/ml of penicillin/streptomycin (Life Technologies), 0.05% collagenase (Boehringer Mannheim, Meylan, France), and 2 U/ml DNase (Sigma-Aldrich). The mixture was stirred at room temperature for 30 min. The tissue-extract was passed through a sterile gauze and centrifuged at 80 × g for 30 s to remove debris. The supernatant was deposited on a 30% Percoll gradient (Amersham Pharmacia Biotech, Uppsala, Sweden) and centrifuged at 1,400 × g for 10 min. The pellet was collected and residual RBCs were removed by hypotonic shock using ACK lysis buffer. BSL were resuspended in FACS buffer (PBS containing 1% FCS and 0.01% NaN3) and counted. BSL were identified by their size (forward light scatter) and granulosity (side light scatter) as previously described (15). Macrophages were identified as F4/80+ (biotinylated rat IgG2b mAb anti-mouse F4/80, clone C1:A3-1; Tebu, Le Perray-en-Yvelines, France). Neutrophils were identified as F4/80− and Gr-1+ (rat IgG2b mAb anti-mouse Gr-1 conjugated to FITC, clone RB6-8C5; BD PharMingen, San Diego, CA). Lymphocytes were identified by their small size and using the following Abs: hamster IgG mAb anti-mouse CD3 conjugated to PE (clone 17A2; BD PharMingen), hamster IgG mAb anti-mouse TCR γδ conjugated to PE (clone GL3; BD PharMingen), hamster IgG mAb anti-mouse TCR αβ conjugated to Quantum Red (QR) (clone H57-597; Sigma-Aldrich), rat IgG2a mAb anti-mouse CD8α conjugated to FITC (clone 53-6.7; BD PharMingen), rat IgG2a mAb anti-mouse CD8α conjugated to QR (clone 53-6.7; Sigma-Aldrich), rat IgG2a mAb anti-mouse CD4 conjugated to QR (clone H129-19; Sigma-Aldrich), and rat IgG2a mAb anti-mouse CD4 conjugated to PE (clone H129-19; BD PharMingen), rat IgG2a mAb anti-mouse CD45R/B220 conjugated to FITC, biotinylated hamster IgG mAb anti-mouse ICAM-1 (clone 3E2; BD PharMingen), biotinylated rat IgG2a mAb anti-mouse LFA-1 (clone 2D7; BD PharMingen), biotinylated rat IgG2b mAb anti-mouse CD44 (clone IM7.8.1; Caltag Laboratories, Burlingame, CA), and biotinylated hamster IgG mAb anti-mouse CD69 (clone H1-2F3; BD PharMingen), mouse IgG2a mAb anti-mouse Vβ8-1,2 conjugated to PE (clone MR5-2; BD PharMingen), rat IgG2a mAb anti-mouse Vβ2 (clone B20.6.5), and rat IgG2a anti-mouse Vβ6 (clone 44.22.1), (both a kind gift of G. Chiocchia, Département d’Immunologie, Institut Cochin, Paris, France) diluted at the appropriate concentration in FACS buffer. Ultravidin-PE-conjugated (Leinco Technologies, St. Louis, MO) and goat anti-rat IgG conjugated to FITC (Polysciences, Warrington, PA) were used as secondary reagent. For each sample, 5,000 cells were analyzed. The data were collected using a FACSCalibur flow cytometer analyzed using the CellQuest software (BD Biosciences, Le Pont de Claix, France). It has been previously shown that the collagenase treatment used during leukocyte purification from the brain does not influence the ability to detect cell surface markers including those analyzed in this study (CD4, CD8, Gr-1, F4/80, CD44, LFA-1, CD62L, CD69, and ICAM-1) (16, 17, 18, 19). Rat IgG anti-mouse CD8 mAbs (clone 2.43; TIB 210; American Type Culture Collection (ATCC), Manassas, VA) were purified from ascites after ammonium sulfate precipitation. Anti-polymorphonuclear cells (PMNs) mAb (clone NIMP-R14) (20) and rat IgG anti-mouse CD4 (clone GK1.5; TIB 207; ATCC) mAbs were purified from supernatant after ammonium sulfate precipitation. A total of 1 mg of anti-CD8, anti-CD4, or anti-PMN mAbs was injected i.p. at day 6 after parasite injection close before the onset of CM. In one experiment, 1 mg of anti-CD8 mAb was injected when mice displayed neurological signs. In another experiment, 1 mg of anti-CD4 mAb was injected twice at day 0 and at day 4 postinfection with PbA. More than 98% of blood CD8+ or CD4+ T cells were depleted by this procedure as verified by FACS analysis using anti-CD4 (clone H129-19; Sigma-Aldrich) and anti-CD8 (clone 53-6.7; BD PharMingen) mAbs which recognized epitopes different from those recognized by the depleting mAbs. Depletion of blood neutrophils was >80% as verified by FACS analysis using anti-Gr-1 mAb. Purified rat IgG (Sigma-Aldrich) was used as a negative control. 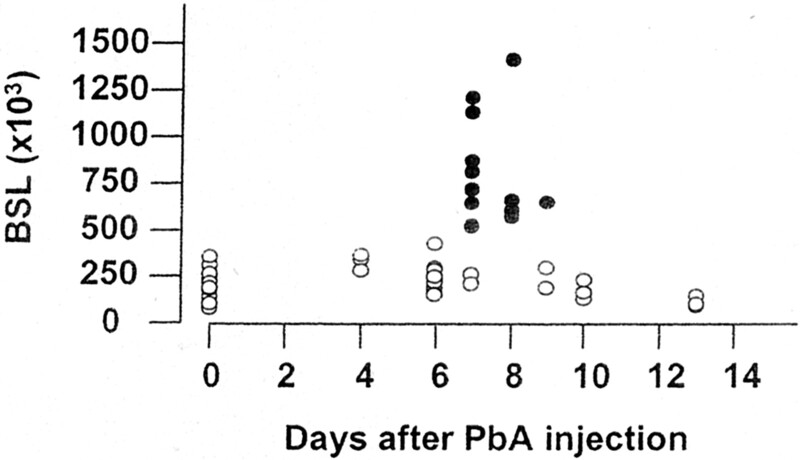 Macrophages were depleted at day 5 after PbA injection by i.v. injection of 0.2 ml of PBS containing ∼1 mg of dichloro-methylene-diphosphonate (Cl2-MDP) encapsulated in liposomes (21). These liposomes were a gift from Roche Diagnostics (Mannheim, Germany). More than 90% of blood F4/80+ cells were depleted as verified by FACS analysis 2 days later. We relied on the ability of a cloned parasite line derived from the PbA strain (10), henceforth referred to as PbA, to induce CM in defined mouse strains. PbA-infected RBCs from this clone cytoadhere in vivo to the cerebrum and the cerebellum vascular endothelium (10). The C57BL/6J and 129/Ola mouse strains generally all (90–100%) succumb of CM when infected with PbA. However, when 129,B6 mice (derived from the two strains above) are similarly infected, a reproducible proportion of mice (60–80%) develop CM early in the infection (days 7–9) and die within <24 h (Fig. 1⇓). In the remaining mice which do not develop neurological signs (non-CM; NCM), the infection progresses and the mice die of hyperparasitemia and anemia a week to 10 days later (data not shown). CM in the mice is characterized by hemi- or paraplegia, ataxia, convulsions, and coma. These symptoms are commonly observed in the African child suffering from CM. We have exploited the two pathologically distinct subgroups of 129,B6 mice in an internally controlled analysis of the events which occur in the brain and which lead to the neurological symptoms and the mortality associated with CM. As a control, we used other host/parasite combinations: BALB/c mice infected with PbA do not develop CM (Fig. 1⇓A), but all die of hyperparasitemia and anemia starting on day 9 postinfection (Fig. 1⇓B and data not shown), while 129,B6 mice infected with P. yoelii or P. chabaudi do not develop CM (Fig. 1⇓A) and all mice survive and clear the infection (data not shown). Susceptibility to CM in PbA-infected 129,B6 mice. 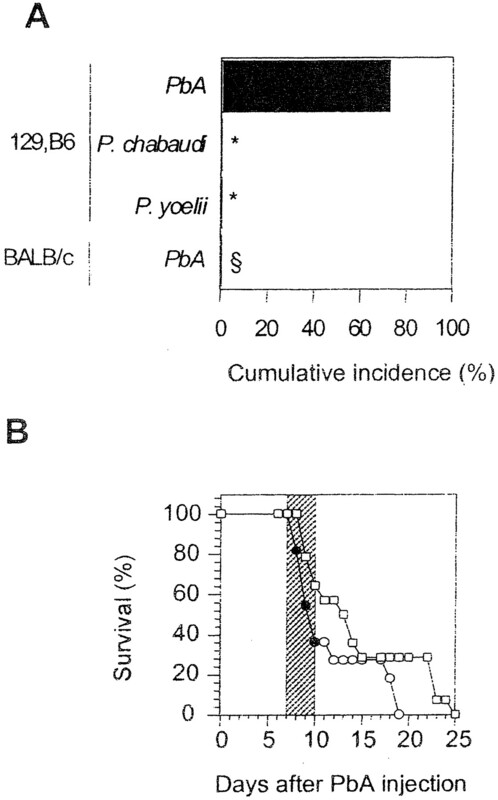 A, Cumulative incidence of CM of 129,B6 infected with PbA (n = 11), P. chabaudi (n = 5), P. yoelii 265 BY (n = 5), or BALB/c mice infected with PbA (n = 14). ∗, p = 0.0256, §, p = 0.0002 vs PbA-infected 129,B6 mice as calculated by Fisher’s exact test. B, Survival curve of 129,B6 (circles, n = 11) and BALB/c mice infected with PbA (□, n = 14). The data shown are representative of four experiments. Mortality from CM (indicated by •) occurs reproducibly in 60–80% of the infected 129,B6 mice. Neurological signs first appear late on days 7–10 (shaded area), with death occurring in <24 h of their onset. Parasitemia rarely exceeds 20% in these CM mice. In the NCM mice which survive beyond day 11, the parasitemia rises up to 70% and they generally all succumb by day 25 as a result of hyperparasitemia and the associated anemia. Histopathological observations of brain sections from mice with and without neurological signs revealed the presence of infected RBCs in both sample sets but characteristic petechial hemorrhages were observed only in CM brains (data not shown). The other striking difference concerned leukocytes in the microvessels, which were relatively more numerous in CM brain sections as compared with NCM ones. The distribution of the leukocytes in the capillaries was observed to be uneven, reflecting observations in humans for both leukocytes (22) and sequestered infected RBCs (23). Therefore, we widened our investigations to include the total number of adherent immune cells present in the whole brain. Mice were sacrificed at different times during the infection, and nonadherent circulating cells in the brain vasculature were removed by extensive perfusion of the brain. The perfused brains were then removed, crushed, and the cells dissociated. The adherent leukocytes were then purified, and quantified and phenotyped by FACS analysis. The total number of BSL obtained throughout infection was seen to increase reproducibly in mice where the neurological signs of CM had appeared (Fig. 2⇓). FACS phenotyping, which was subsequently performed for the isolated BSL, revealed an increase in the numbers of macrophages, neutrophils, and T cells but not of that of B cells (Table I⇓). Numbers of BSL during the course of the PbA infection. Enumeration of BSL was performed on perfused brains obtained at different days after infection: before inoculation (n = 13), 4 days postinfection (n = 4), before the appearance of neurological symptoms (day 6; n = 9), in mice at the time when CM is diagnosable (days 7–9; n = 13), mice without neurological symptoms in the same period (days 7, 9, and 10; n = 7), and finally in mice which did not develop CM (day 13; n = 3). •, Mice with neurological signs (CM). ○, Mice without any neurological signs. To establish whether any of the cell subsets where an increase was observed were implicated in CM pathology, depletion experiments were conducted close before manifestation of neurological signs. A role for NK cells in CM had been excluded previously (8), and these cells were not further investigated. The development of CM was not abolished by either Ab depletion of neutrophils on day 6 postinfection or by Cl2-MDP-mediated depletion of macrophages on day 5 (Fig. 3⇓). Thus, CM pathology appears to be associated with brain-sequestered T lymphocytes. To establish whether one or more of the T lymphocyte subsets were implicated, we phenotyped these brain-sequestered cells from CM and NCM mice (Table II⇓). As compared with brains of naive mice, the total αβ and γδ T cell numbers were twice as high in the NCM brains but showed a 15- to 20-fold increase in CM brains. Significant differences between CM and NCM whole brains in the numbers observed for all the subsets of the whole brain-sequestered T cells was taken as an indication for a putative causal role. The numbers of αβ and γδ CD4+ T cells did not significantly differ between the two infected groups (Table II⇓), and Ab depletion of CD4+ T cells at day 6 postinfection did not prevent the development of CM (Fig. 4⇓A). An effector role of CD4+ T cells was thus excluded. Although the number of γδ CD8+ T cells tended to be higher in the CM brains as compared with NCM brains, this difference was not statistically significant (Table II⇓). Exclusion of a pathogenic effector role for all γδ T cells is supported by experiments where depletion of these cells at a time close to the onset of CM failed to prevent the pathology (24). The two remaining putative CM effector subsets were the αβ CD8+ T cells (4% of the BSL populations) and the CD4−CD8− T cells. The latter remarkably accounted for ∼90% of the sequestered T cells. Because depletion of the double negative population is not feasible, we tested whether Ab depletion of CD8+ T cells at day 6 postinfection could prevent the development of CM (Fig. 4⇓A). Depletion of CD8+ completely abrogated the development of CM pathology with the mice dying of hyperparasitemia and anemia in the third week postinfection (Fig. 4⇓A), thus ascribing the effector role to CD8+ T cells and excluding it for the double negative. Analysis of the BSL populations from the CD8+-depleted mice confirmed that the specific depletion of these cells on day 6 did not significantly influence the numbers or the phenotypic composition of the other brain-sequestered cells, including the large numbers of CD4−CD8− T cells (Fig. 4⇓B). When CD8+ T cells were similarly depleted in PbA-infected C57BL/6J and 129/Ola mice, the development and mortality from CM were completely abrogated (0 of 10 mice in the CD8-depleted groups vs 9 of 10 in the C57BL/6 control group and 10 of 10 mice in the 129/Ola control group). The essential role of CD8+ T cells was confirmed by the use of CD8+ T cell-deficient C57BL/6J mice (CD8 or TAP-1 knocked out (KO)). In these mice, infection by PbA did not lead to CM, and all the mice died of hyperparasitemia and anemia in the third week postinfection (Fig. 4⇓C). We also analyzed the composition of the BSL on day 7 postinfection in mouse-parasite combinations where CM does not develop: P. yoelii and P. chabaudi in the 129,B6 mice and PbA in BALB/c mice. The number of sequestered T lymphocytes in the first two host-parasite combinations (P. yoelii: 25,800 ± 11,600; P. chabaudi: 18,400 ± 1,100) did not differ significantly from that observed in naive 129,B6 mice (36,200 ± 11,900). In BALB/c mice, a significant increase (p < 0.05, Mann Whitney U test) of leukocytes was observed in PbA-infected mice (526,000 ± 42,300) as compared with naive mice (298,600 ± 18,600). Although a significant increase of the CD8+ T cells found in the brain was observed in the infected mice, the actual numbers for this subset were >20-fold lower than those found in PbA-infected 129,B6 CM mice (p < 0.005, Mann-Whitney U test). It should be noted that the CD4−CD8− T cells found in the brains of these NCM BALB/c mice also represent >90% of the brain-sequestered T lymphocytes, further confirming their lack of involvement in CM pathology (Table III⇓). Late depletion of macrophages or neutrophils does not prevent development of CM. Cumulative incidence (A and B) and survival (C and D) of 129,B6 mice treated with rat IgG or anti-PMN (A and C) and PBS or Cl2-MDP (B and D). Five mice per group were used. The role of T cells in CM. 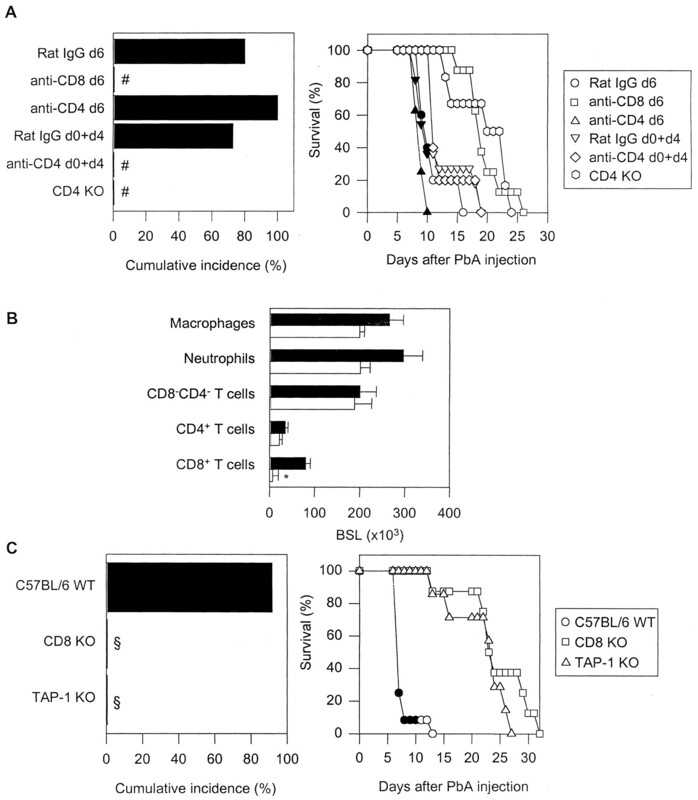 The effector role of CD8+ T cells and the inducing role of CD4+ T cell in CM were demonstrated through a series of deletion experiments and infections in deficient mice. 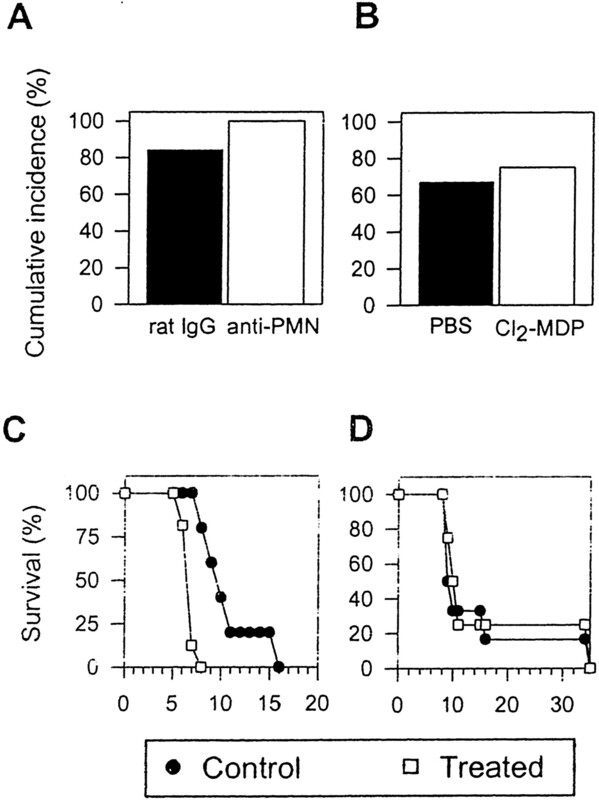 A, Cumulative incidence of CM in (left panel), and survival curve (right panel) for PbA-infected 129,B6 mice injected with the following rat Abs: control IgG (n = 10), anti-CD8 (n = 10), or anti-CD4 (n = 7) on day 6; control IgG (n = 11) or anti-CD4 (n = 5) on days 0 and 4; and finally of CM in PbA-infected 129,B6 CD4 KO mice (n = 8). #, p < 0.05, Fisher test vs PbA-infected 129,B6 mice treated with control rat IgG. Mortality from CM is indicated by filled symbols. B, Analysis of BSL in PbA-infected CD8+ T cells-depleted 129,B6 mice at day 6 (□), and PbA-infected 129,B6 mice treated with control rat IgG and which developed CM (▪). ∗, p < 0.05, Mann-Whitney U test vs nondepleted mice. C, Cumulative incidence of CM in (left panel), and survival curve (right panel) for PbA-infected C57BL/6 WT (n = 11) and CD8+ T cell-deficient mice: CD8 KO C57BL/6 (n = 6) and TAP-1 KO C57BL/6 (n = 6). §, p < 0.0001, Fisher test vs C57BL/6 WT mice. Mortality from CM is indicated by filled symbols. Attempts to prevent the inevitable mortality of mice that developed patent neurological manifestations by the injection of anti-CD8 Abs were only partially successful. Mortality from CM was abrogated in 30% of the mice (3 of 10) injected with the depleting Ab, and all the mice (0 of 12) injected with the control Ab succumbed to CM. The activation status of the BSL CD8+ T cell fraction from CM mice was analyzed (Fig. 5⇓). The cells were enlarged indicating that they had transformed into lymphoblasts and were activated. It was interesting to note that >80% were CD69low, CD44low, LFA-1low, or ICAM-1low, an unusual phenotype for cells which have migrated. Nonetheless, >90% of these cells were positive for two chemokine receptors, CCR2 and CCR5, involved in trafficking (E. Belnoue, F. T. M. Costa, A. M. Vigario, T. Voza, F. Gonnet, I. Landau, N. Van Roorjen, M. Mack, W. A. Kuziel, and L. Rénia, manuscript in preparation). It has been recently found that CD8 Vβ8.1,2+ T cell numbers are increased in the peripheral blood of CM mice, thus prompting the proposal that this cell subset is specifically involved in CM pathogenesis (25). Our results accord with this hypothesis as this subset formed 50% of the αβ CD8+ T cells (36% of total CD8+ BSL) in BSL from CM mice (Fig. 6⇓). Phenotype of brain CD8+ T cells. Two parameter dot plots of leukocytes from brain of naive 129,B6 (A) or PbA-infected 129,B6 mice with (C) or without (B) CM. Histograms (D) representing expression of activation or adhesion molecules on CD8+ T cells from brain of PbA-infected 129,B6 mice with CM. Results are representative of three to five mice per group. Vβ8.1,2 expression on brain-sequestered CD8+ T cells. 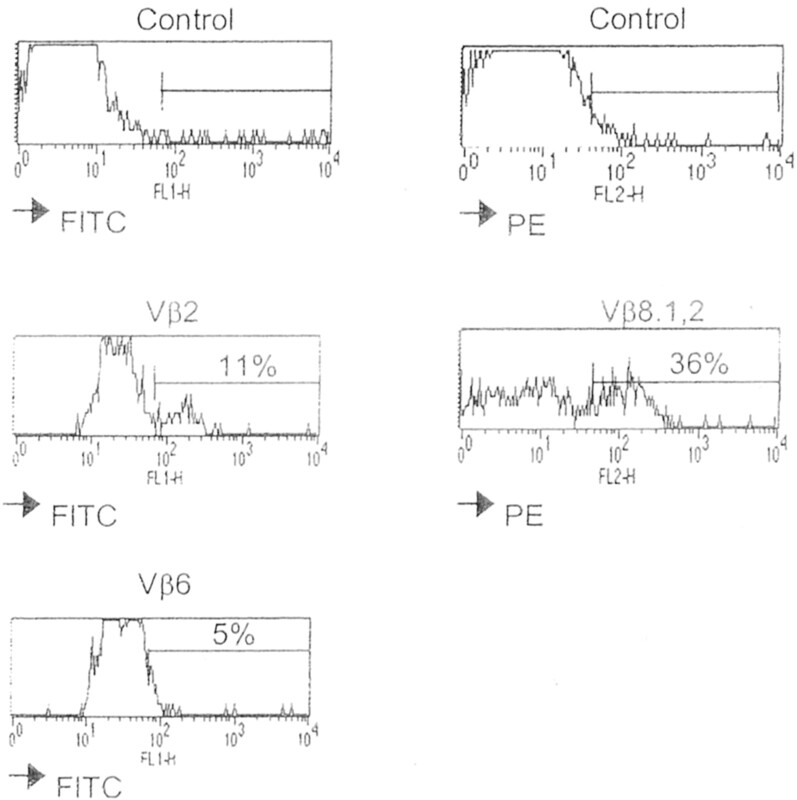 Histograms representing expression of different Vβ on CD8+ T cells from brain of PbA-infected 129,B6 mice with CM. Results are representative of three to five mice per group. Our results demonstrate an effector role for brain-sequestered CD8+ T cells in mice at the time when CM pathology is manifest. However, these observations do not preclude a role for other peripheral leukocytes in the evolution of the CM pathogenic process. A role for CD4+ T cells in the induction of CM was brought to light when CM was abrogated in CD4-deficient mice (Fig. 4⇑A). This was confirmed when Ab depletion of these cells prevented the development of CM only when conducted early in the infection but not immediately before the onset of the neurological symptoms (Fig. 4⇑A). Cellular events in the brain which contribute to the pathogenesis of CM in humans can only be deduced from postmortem samples which are difficult to procure and often only consist of a small biopsy. Using a defined rodent model where a discriminative pathology is obtained, we conducted whole brain cellular and functional analysis of immune effector cells in serial brain samples from CM and NCM mice. The key finding was that the neurological symptoms and the ensuing death from CM of the PbA-infected mice were due to the sequestration of a total of 20,000–50,000 CD8+ T cells in the vasculature of the whole brain (∼4% of the BSL). The low number of these pathogenic cells was confirmed by histopathological staining, where only one to two CD8+ T cells could be observed for sections of 10–15 mm2 (data not shown). No evidence for a specific localization could be noted despite careful examination of a large number of brain sections. The role of these cells would have been difficult to suspect from simple examination of a limited number of human brain histopathological sections. Although the effector role of CD8+ T cells is clear, other leukocyte populations such as CD4+ T cells play a role in the initiation of pathogenesis (6, 7, 8, 24, 25, 26, 27). Recent works by Chang et al. (28) have shown that CD8+ T cells mediate circulatory shock, vascular permeability changes, and edema in the brain and the lung during PbA infection. These results suggest that CD8+ T cells may induce pathological perturbations in other organs, possibly through an interactions with endothelial cells (ECs), thus reinforcing the role of these cells are a key effector in the severity of malaria. Our findings suggest an immunological mechanism for the pathology of CM. The pathological cascade is initiated when ECs are activated. This is primarily due to parasite sequestration to the brain EC. Activation of EC is known to be influenced by levels of circulating cytokines such as TNF and IFN-γ (29), two cytokines in which production is strongly induced by the malaria parasite (5, 30). Activated EC can ingest parasite material (31) which could be presented via MHC class I and II molecules often seen to be up-regulated during the infection (32, 33). Effector CD8+ T cells could then destroy those cells which present parasite-derived Ags, thus leading to the breakdown of the blood-brain barrier and the consequent pathology. Recent experiments (34) indicate that perforin is necessary for CM mortality, thus suggesting that the damage due to CD8+ T cells is mediated by this pathway. Once initiated, the CD8+ T cell-mediated damage might be difficult to reverse, as indicated in our experiments. Clinically, the extent of the damage and thus severity will depend on the level of EC activation and the efficiency of CD8+ T cell recruitment. The former is ultimately linked to parasitemia levels and the extent of brain-specific sequestration of infected RBCs. In conclusion, the data and the mechanism we present reinforce the notion that the most important event to target in interventions aimed at reducing the incidence of CM is the initiating event, i.e., sequestration of the parasites to the brain ECs. It is difficult to envisage at present experimental scenarios where the pathogenic potential of brain-sequestered CD8+ T cells can be formally demonstrated in humans. It would be of great interest to investigate whether a skewing of the TCR Vβ repertoire of peripheral CD8+ T cells, which has been elegantly demonstrated in mice (25) and confirmed for the brain in our experiments, also occurs in humans. We thank F. Gonnet for her help in histology, and E. Badell and P. Druilhe for anti-neutrophil Ab. We also thank Pierre Druilhe, Anne Charlotte Grüner, Artur Scherf, and Robert J. Wilkinson for their careful review of the manuscript. ↵1 This work was supported in part by grants from Junta Nacional de Investigação Cientifica e Tecnologica and Fondation de La Recherche Médicale (to L.R.). E.B. held a fellowship from Ministére de l’education nationale de la Recherche et de la Technologie. A.M.V. held a fellowship from Junta Nacional de Investigação Cientifica Tecnologia. ↵2 Current address: Instituto Gulbenkian de Ciencias, Oieras, Lisbon, Portugal. ↵4 Abbreviations used in this paper: CM, cerebral malaria; NCM, non-CM; WT, wild type; KO, knocked out; BSL, whole brain-sequestered leukocyte; PbA, P. berghei ANKA; Cl2-MDP, dichloro-methylene-diphosphonate; EC, endothelial cell; PMN, polymorphonuclear cell; QR, Quantum Red.